Spray a 12 to 15 Cup Bundt pan with non-stick baking spray with flour. 2. In a large bowl place butter, sugar and maple sugar. Beat on medium speed with a mixer until fluffy. Add eggs, one at a time. Beating well after each addition. 3. In another bowl combine flour, baking powder and salt. Gradually add to the butter mixture alternately with the buttermilk. 4. Spoon the batter into the prepared pan and bake for 1 hour or until a wooden toothpick comes out clean. 5. Cool in the pan for 20 minutes then remove from the pan, and cool completely on wire rack. 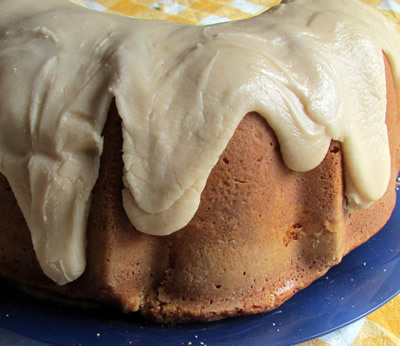 Place on a cake plate and spoon Browned Maple Glaze (see recipe below) onto the cake. 1. In a medium stainless steel skillet, heat butter over medium heat for 4 to 5 minutes, until browned. Be careful not to burn the butter. Remove from the heat and add the maple syrup. The mixture will bubble slightly. 2. Allow to cool for 10 minutes. Put the confectioners sugar and milk into a medium sized bowl. Add the butter and syrup mixture and whisk until smooth and pourable. 3. Pour over cake allowing the glaze to drip over the sides.